Photo by Chris Hansen Courtesy of Fortitude Dance Project. Female empowerment is quite heavily in the cultural discourse these days – from “#metoo” to “#timesup” to several female political candidates ascending to office (and defeating their male challengers). When in women’s lives do we begin that instilling of empowerment? How do we do that? These questions can feel diffuse and gigantic. 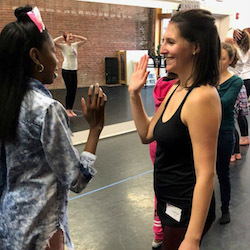 Yet in Boston, both Fortitude Dance Project and Nozama Dance Collective are answering these questions with targeted, specific methods – empowering teens and pre-teens through dance. 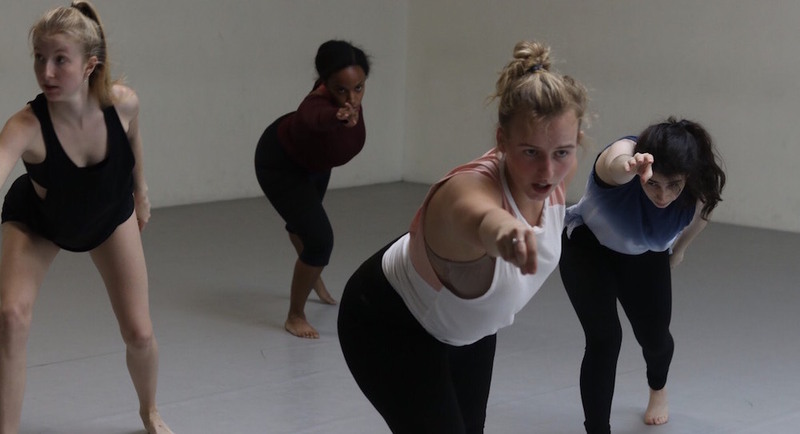 Fortitude Dance Project’s initiative took place through a dance intensive structure, at Green Street Studios in Cambridge, Massachusetts. Bettina Mahoney is the founder/president of Fortitude Dance Project (with Leslie Fitzpatrick as the artistic director), and also led these classes. Students ranged from 14-24 years of age. Class structures were more or less that of conventional dance classes, with some words of wisdom to foster empowerment in the young dancers. She would occasionally stop the music to remind dancers of their own strength and capability, for instance. Mahoney loves to teach a Pilates warm-up, giving students literal and metaphorical inner core strength. 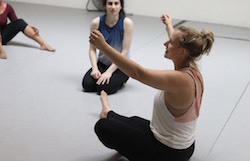 Mahoney describes how something as seemingly simple as picking up choreography or moving confidently across the floor with eyes up can brings these feelings. “Dance gives you confidence and skills for life, whether you’re dancing or in a corporate office,” she says. She knows that these effects happen, at least for some students. She told the story of one student who was somewhat shy and quiet. She later met the student’s father, who affirmed that the student came home and told him how she had such a good time dancing. “She’s never been so happy and excited,” the father told her. Mahoney believes that part of why she can do this is because she’s “very perceptive and intuitive” when it comes to students’ needs and feelings; she can tell whether or not they’re feeling good in class, and act to help them if needed. 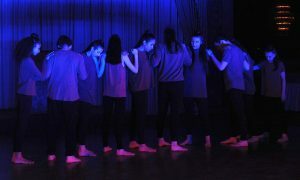 Photo courtesy of Nozama Dance Collective. Nozama Dance Collective’s classes have also worked toward empowerment, with additional themes to tie into that overarching one. A recent theme was respect (for both self and other, given the recent passing of Aretha Franklin), for instance. The company’s program serves girls eight to 12 years of age, in collaboration with the Boston branch of Big Sisters (each student with a big sister). Gracie Novikoff, Nozama co-founder and artistic director, reached out to the Big Sisters Association (BSA), and the organization loved the idea. She’s run the program ever since, in collaboration with the BSA. 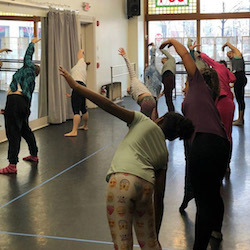 Some of the classes have taken place at Green Street Studios, and some at The Dance Complex (one block away, in Cambridge’s Central Square neighborhood). 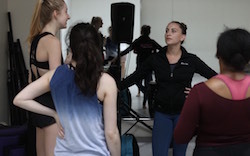 Natalie Nelson Schiera, Nozama co-founder and artistic director with Novikoff, explains how various factors have played into planning classes, including dance experience and social, mental and emotional maturity. She and Novikoff also stay attuned to the group of students and their Big Sisters during classes, and make any necessary changes in real-time. This approach has helped with the fact that the students have varied levels of dance experience. Classes have been one-and-a-half hours, with 15 minutes built in for arrival (and any latecomers), rapport building and introducing the theme of the particular day. The teacher pair always ensure that they remind students to do what feels good for their body, and not to worry about getting everything “perfect”. Schiera asserts that “there is a structure to dance, but anything can be dance – walking on a beach can be dance!” Novikoff describes trying to seek a balance between pedestrian accessible movement and dance technique, so that students are receiving true dance education but everyone feels comfortable and confident. Classes have begun with an introduction and short discussion between the big and little sisters. With the “respect” theme, for instance, the two teachers will direct students to discuss what showing respect – for self and others – really means. At other times, the students have shared what they love most about their big or little, self-love and how they can support each other. Warm-ups follow, leading into across-the-floor work. Novikoff explains how they include phrasework that will be in the combo later on in class. They then move into the combo. Both Novikoff and Schiera mention including a “handshake” section that “Bigs” and “Littles” can choreograph themselves. This offers an opportunity for materializing creativity, and through that building confidence. After working on the combo for a bit, “we join in a circle, take a big breath in and out together, and then debrief – what students did and didn’t like, or anything else they want to share,” says Novikoff. Novikoff also shares a story from one of this summer’s classes that really stuck out to her. One of the students asked if she could share something from school. Novikoff was perplexed as to what this could be but allowed it at a time of class when it would be appropriate and feasible. What the student shared was an incredible hip hop dance, Novikoff explains. The student beamed with pride, and Novikoff was so happy to have been able to offer that for her – a space to show something she had created, and to be proud of it. The wider Nozama community has been getting involved in the work as well, Novikoff explains. 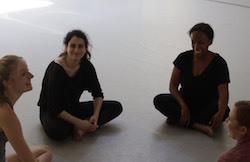 Juliana Reinold and Teresa Tobin, Nozama company members, have been assisting workshops and recently ran the “respect” workshop. Audience members at Nozama’s most recent show, Enough, donated to help make future workshops possible. It takes a village, some say. 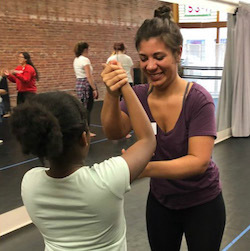 There’s a growing village of dancers and dance enthusiasts in Boston using dance to help empower, and foster empowering values, in young girls. If youth are truly the future, there seems to be few things more valuable and important. For more information on Fortitude Dance Project and Nozama Dance Collective, visit www.fortitudedanceproject.com and nozamadancecollective.wordpress.com.